“The city of Flint was hit hard by the lead crisis and we wanted to make sure that a part of our campaign was giving back to families directly impacted." Clean water innovator HaloSource,Inc. (“HaloSource” or the “Company”) launched an Indiegogo campaign on World Water Day, March 22, to crowdfund pre-orders of its new astrea™ bottle in the U.S., and we are pleased to announce that the campaign has achieved its $50,000 campaign goal. Pledging support to “Kick the Lead Out!” and reaching the $50,000 goal unlocked two special edition bottles that are now available. Additionally, HaloSource will donate $5 for every astrea™ bottle sold during the rest of the campaign to the Flint Child Health and Development Fund (the “Fund”) of the Foundation for Flint. The Fund focuses on the long-term health and development needs of Flint children exposed to lead. While other bottles claim to filter your water, astrea™ was specifically designed to filter out the most common water contaminants, including heavy metals, and all forms of lead. 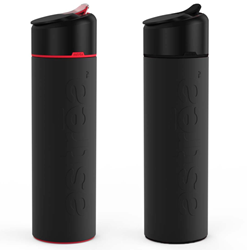 From testing to date, astrea™ expects to be the world’s most effective daily-use filtering water bottle tested to remove lead and other heavy metals to the most rigorous National Sanitation Foundation standard – NSF 53 – and intends to empower consumers to filter the uncertainty out of their water. It is not too late to own the new astrea™ bottle and help ‘Kick the Lead Out” – pledge your support at https://igg.me/at/astrea now through May 5, 2018.